266 pages | 3 B/W Illus. In today’s world where other cultures are being tapped to a greater extent than ever before, the processes of mixing and matching are especially relevant in making sense of Russia. Not only do borrowing and assimilation, interaction between the familiar and the alien, constitute a venerable tradition in Russian culture, but during the two last post-Soviet decades a notable Western influence has become apparent. This book provides means for understanding Russianness in this new situation. By bringing together Russian and Western, eminent and younger scholars it provides insights both from inside and outside. 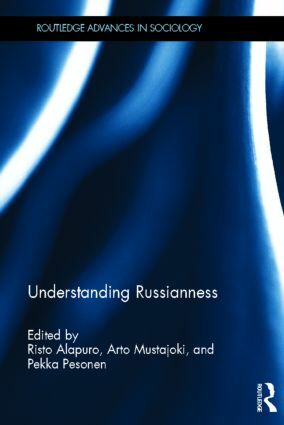 By extending its perspectives to three fields – linguistics, cultural studies, and social sciences – it covers different dimensions of creative misunderstandings , hybrids, tensions and other modes of adaptation in the Russian culture. By offering concrete case studies it avoids easy stereotypes, deconstructs clichés, problematizes accepted truths, and identifies points of interaction between Russia and the West. Introduction Part 1: Language 1. The 'West' in the Linguistic Construction of Russianness in Contemporary Public Discourse 2. Attitudes toward the Russian and English languages in Russia and the United States: Perceptions of Self and Other 3. Russification of Western Concepts: Political Will and Crisis in a Russian way 4. A Russian View of Western Concepts Part 2: Society 5. Russian 'Otherness': From Chaadaev to the Present Day 6. From a Mother's Worry to Soldiers' Mothers action: Building Collective Action on Personal Concerns 7. Opposition Substitutes: Reflections on the Collective Action in Support of the European University at St. Petersburg 8. Political Culture in Russia in a Local Perspective 9. Soviet Modernity: The case of Soviet Fashion Part 3: Culture 10. Spiritus Loci: Two East Karelian Fokelore Epic Traditions 11. Autogenesis in Russian Culture: An Approach to the Avant-garde 12. Two Hundred years of Poshlost: A Historical Sketch of the Concept 13. The Notion of Universal Bisexuality in Russian Religious Philosophy 14. Religious Nationalism in Contemporary Russia: The Case of the Ossetian Ethnic Religious Project 15. Social Networking on the Internet: Is the Russian Way Special? Risto Alapuro is Professor Emeritus of Sociology at the University of Helsinki, Finland, and the head of the Helsinki Research Group for Political Sociology. His recent publications include the co-edited volumes Beyond Post-Soviet Transition: Micro Perspectives on Challenge and Survival in Russia and Estonia (2004), Nordic Associations in a European Perspective (2010), and Political Theory and Community Building in Post-Soviet Russia (2011). Arto Mustajoki is Professor of Russian Language and Literature at the University of Helsinki, Finland. His research interests include functional syntax, features of contemporary Russian, corpus based research, intercultural communication, and identities. He has published seven books and over eighty related research articles. Pekka Pesonen is Professor Emeritus of Russian Literature at the University of Helsinki, Finland, and the head of several international research projects including Modernism and Postmodernism in Russian Literature and Culture, and St. Petersburg/Leningrad: History--Narration--Present. Among his research interests are Russian literature and culture (especially modernism and postmodernism), and cultural semiotics. He has published three monographs, eighteen edited books, and about one hundred research articles.